I seriously can’t get over what a huge change it is already. I was able to happily spend time in my yard this weekend fixing it up. Haven’t done that in a few years. My only regret is not having it done 3 years ago. I labored over this decision but the end result was worth every cent. Only people with dogs can truly understand what we’ve been going through for the past few years. Your guys were really wonderful. Very professional, friendly, and stayed on task the entire time. And the job went fairly quickly. I am beyond thrilled and one happy customer! 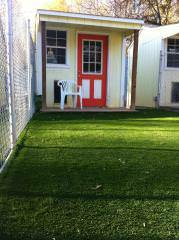 -Toni K.
Perfect Turf has been a life saver for our one dog that is allergic to grass and the other 7 dogs have a blast playing/running on it as well. -Sandra B.